FM Raymond Song is continuing his impressive form, leading the 2019 SIO with 4/4. He scored his second win in a week over WGM Padimi Rout, this time with an early piece sacrifice, which while not giving him an immediate reward, gave him enough pawns to win the ending. Half a point behind are GM Abhijit Kunte, IM Junta Ikeda, GM Daniel Fernandez, FM Jack Puccini and FM Daniel Gong. Round 5 sees Song against Kunte and once again, a win for Song (or even a draw) will put him on track for at least an IM norm. Some opening advice I read when younger was "if you start with e4 then your aim is to play d4. If you start with d4 then your aim is to play e4". A bit simplistic of course, but when it works, it works! The 2019 Sydney International Open, which is part of the Macquarie University Chess Festival, has just started. The returning event (which previously ran up until 2014) has attracted over 170 players across the 3 events. The top tournament has 60+ players, while the Peter Parr Memorial Challengers has more than 70 players taking part. GM Abhijit Kunte is the top seed, followed by English GM Daniel Fernandez. Another player looking to do well is FM Raymod Song, who is hoping for a second IM or GM norm, following on from his outstanding performance at the 2019 O2C Doeberl Cup. The tournament runs for the next 5 days (until Sunday), with rounds at 12 noon and 6pm. There is also a junior tournament taking place on Saturday and Sunday mornings, and eligible players can still enter that event. GM Hrant Melkumyan is the outright leader of the 2019 O2C Doeberl Cup after 6 rounds. Melkumyan was the only leading player to win both his games on the third day, and he now holds a half point lead over the 5 players who share second place. Melkumyan started the day with a win over IM George Xie in round 5, and defeated GM Darryl Johansen in round 6. Xie had a shocker of a day on Saturday, losing to Melkumyan, and then being defaulted in round 6 after 15 moves, when it was discovered he was carrying his mobile phone in his pocket. While the phone was switched off (this being checked by the arbiting team), this is still ground for an instant loss. Xie accepted this ruling, but then decided that as the loss left him with little chance of winning a prize, he would withdraw from the event. Round 7 sees Melkumyan versus GM Anton Smirnov on board 1, with GM Deep Sengupta v IM Igor Bjelobrk on board 2 and FM Raymond Song v WGM Padmini Rout on the third board. Song drew both his games yesterday, but is still on track for a GM norm. Last night also saw the 2019 Doeberl Cup Blitz event, with 114 players taking part. Tom Maguire won the tournament with 8/9, ahead of Fred Litchfield and Sravan Renjith on 7.5. The second day of any Doeberl Cup is when the tournament really kicks into gear. All 4 events (Premier, Major, Minor and Mini) are running simultaneously, which means over 250 players all gathered in the one room. In past years this has resulted in some organisational headaches, but this year everything is running much more smoothly. The Premier is of course the main focus of the weekend, and adter 4 rounds there is a 5 way tie for first. WGM Padami Rout, GM Deep Sengupta, FM Raymond Song, GM Anton Smirnov and GM Darryl Johansen are all on 3.5/4. The standout performance from this group is FM Raymond Song, who is already well placed for both an IM and GM norm. His current TPR is just above 2700 and more importantly, he has already played the right mix of titled and overseas players. He is playing GM Anton Smirnov in the 5th round, and a win or draw would leave him well placed for the rest of the event. There are a number of strong players still with a chance on 3 points, including top seed Hrant Melkumyan. Melkumyan was held to a draw in round 3 by young FM Jack Puccini, but returned to the winners list in round 4, beating Canberra junior Albert Winkelman. One other player of interest on 3 points is FM Jason Hu, who won his 4th round game against IM Stephen Solomon. The Major and Minor got of to their predictable starts, with a large number of upsets on the top boards. The top 4 seeds in the Major scored a combined 50% against there lower rated opponents, while the top 10 seeds in the Minor did a little better, scoring 60%. Tonight is the traditional Doeberl Lightning, which starts at 7pm. This event will be FIDE rated for the first time, and organisers expect around 100 players for the 9 round event. The 2019 O2C Doeberl Cup is underway, with the first day seeing the players from the Premier in action. The slightly smaller field in the Premier resulted in the first days play being a little tougher for the top seeds than in previous years. While round 1 saw very few upsets, the second round saw draws on 3 of the top 4 boards, and only 1 of the top six seeds finishing the day on 2/2. In the last game of the night to finish, IM Gary Lane resisted the temptation to grab pawns in the ending to draw with top seed GM Hrant Melkumyan. FM Raymond Song looked better against GM Deep Sengupta on board 3, but Sengupta found the draw in the always tricky Q v Q and Rook pawn ending. GM Anton Smirnov won a knight v bishop ending against IM Stephen Solomon, while FM Jack Puccini upset IM Junta Ikeda in one of the more interesting games of the evening. Smirnov is part of the leading group on 2 points, along with IM Brodie McClymont, Puccini, IM Padami Rout, GM Darryl Johansen, IM George Xie, and IM Trevor Tao. The day got off to a slightly worrying start, when the organising team arrived at the venue to find no tables. A mix up in communication meant a delayed delivery, and a slightly rushed set up. Nonetheless the tournament was started on time, with all but one player present (an overseas IM failed to arrive). Fortunately we were ale to call on the services of 'super sub' IM Vladimir Smirnov, to avoid a first round forfeit in the affected pairing. Today sees the start of all the other events.With a few last minute entries, the total size of the event is a little over 250 players, which is a good turnout, considering the drop in number for the Premier. All the tournament results and pairings can be found at www.doeberlcup.com.au There is live coverage of the Premier at chess24.com or and you can follow the link to there from the tournament website. You can see the top games from the boards via the same link, noting that the round 1 games are incomplete at the moment. GM Hrant Melkumyan first played in the Doeberl in 2014, and has gone close to winning it on a couple of occasions. This year he is the top seed and rating favourite to win the tournament. But as past years have shown, it isn't an easy tournament to win, as one misstep can prove fatal. In 2016 Melkumyan was close to winning, but it turned out to be IM James Morris's year. However he did have the satisfaction in beating fellow GM (and regular Doeberl visitor) SS Ganguly. The 2019 O2C Doeberl Cup is only a couple of days away, and everything is almost read for a long weekend of chess. With 1 day to go before entries close, there are 245 players registered, a small increase over last year. Numbers are up across all events, except for the Premier, which has only 51 players entered so far. Armenian GM Hrant Melkumyan is the top seed, with Australian GM Anton Smirnov seeded second. Third seed is GM Deep Sengupta (IND), who has just finished equal first in the 2019 Bangkok Open. If you wish to watch the action in person, the venue is the Southern Cross Club in Woden, ACT. The venue is quite large so spectators will have the opportunity to see all the action up close. GM Ian Rogers will also be doing live coverage of the tournament at the venue. This normally starts about an hour after the round begins, and runs until the top games for the round have been completed. The tournament will also be broadcasting the top board games via Chess24. Visit the https://www.doeberlcup.com.au for all the links to the coverage, as well as results and information about round times etc. If you are looking for an easier way to do game entry, a solution may be at hand. https://www.reinechess.com/ is providing a test service which allows scoresheets to be scanned, and pgn files produced. It does involve the use of specially formatted scoresheets (and neat handwriting), but unlike other solutions I have seen, the requirements are not that onerous. The system is web based, but importantly, it is an open source project (with the code on Github), so it can be reconfigured if necessary. To install your own version requires some technical knowledge (it is written in python and uses the flask framework) but if you are into image and text processing it looks like something worth exploring. I did not collect many games from the 2019 Dubbo Open, which is a bit of a shame as there were some quite interesting efforts. One game I did get involved one of the classic mating patterns, Philidors Legacy. At the time I had the impression that White was unaware of what was coming, as he would have taken on f2, and probably lost more slowly. Fortunately for 'miniature' fans he did not. Up until a certain point we have our own 'pet' opening systems. The one true opening that will defeat all that dare challenge us. For me it is the Traxler. For a lot of other players it is the Morra Gambit in the Sicilian. But to quote Mike Tyson "Everybody has a plan until they get punched in the mouth". GM Nigel Short was recently on the black side of a Morra, and took it apart pretty effectively. While the KO was delivered on move 22, the 'punch in the mouth' came a fair bit earlier. Then, after the game Short took to twitter to express his disdain for the whole opening system. What do you do when you feel you are no longer improving? One idea is to study something that is the complete opposite of what you have been working on up until now. The reasoning behind this is to find big improvement in new areas, rather than small improvement in something you already know. Certainly this seems to be working for me at the moment, as I am studying some of the positional classics from the 1920's and 30's. But rather than show one my my imperfect games, I'm choosing a game from someone who seems to be going in the other direction. In recent years Magnus Carlsen has been content to target small weaknesses in his opponents position, and then grind out a win. However this strategy ran into a brick wall during his World Championship Match against Fabiano Caruana. Possibly as a reaction to this, he has played more dynamic chess at the Gashimov Memorial, and has been reqraded with another strong tournament performance. The stand out game from this event was the following attacking win over Anish Giri. It is worth pointing out that Giri himself also played an atypical game, taking the pawn on e3, and allowing Carlsen to launch a strong, and eventually winning attack. GM Darryl Johansen has won the 2019 Dubbo Open, finishing on 5.5/6. Starting the day on 3/3 Johansen defeated newcomer Blake Lynch in round 4, drew with CM Leon Kempen in round 5, before beating WFM Alana Chibnall in the final round. Leon Kempen had a chance to join Johansen in first place, but drew his final round game, to finish outright second on 5. There was a 5 way tie for third between Trevor Bemrose, Matt Radisich, Paul Russell, Dominic Fox and Andriy Bukreyev. Local junior Eamonn Fitzgerald picked up the best junior prize, while John Pascoe and Chris Nadolny tied for Best Under 1400. Apart from the prize winners, good performances were recorded by tournament newcomers Blake Lynch, Vladimir Chugurov and Matthew Chippendale, all scoring 4/6. Overall the tournament was a great success, with a good entry of 42 players. As the arbiter, I did not have any major incidents to deal with, although I did have one amusing situation. Two players had medical conditions preventing them from recording their moves, and as fate would have it, they were paired to play each other during the event. I acted as the scribe for the game, which was played at a significantly faster the usual, contained a couple of interesting illegal moves, and ended with a strange double blunder. Next year is the 20th Dubbo Open, and the organisers are planning to make it a bigger event, both in terms of numbers, and prize money. The 2019 Dubbo Open started with a couple of surprises. The first one was the appearance of GM Darryl Johansen as the tournament top seed. Johansen was enjoying a driving holiday in country NSW and decided to drop in and play. The second surprise was the number of first round upsets, with 6 of the 20 games going the 'wrong way'. This in part was due to a number of unrated player who turned out to be better than normal beginners. In fact two of the players, Blake Lynch and Vladimir Chugunov finished the first day with 3 from 3, and share the lead with Johansen and Leon Kempen. Half a point behind the leaders are Andriy Bukreyev, Alana Chibnall and Trevor Bemrose. Chibnall was held to a draw by unrated Bukreyev and plays Bemrose in tomorrow mornings round. The 2019 Dubbo Open starts tomorrow, and there is a reasonably large contingent of players from Canberra attending. Taking into account meal breaks and other contingencies, the travel time between the two cities is around 5 hours by car. Based on nothing more than experience, 5 hours travel seems to be at the upper end of how long players are willing to spend traveling to an event. This not only applies to travel by car, but also via other means. For example, there are a massive number of Indian players taking part in the 2019 Dubai Open, which involves flight time of around 3 to 4 hours. On the other hand, when trying to attract Indian players to events in Australia, the long travel time was often given as a reason for the lack of interest. Of course some events are too good to pass up (Zonals, Olympiads etc), but for the casual player too much travel time is one obstacle that is hard to overcome. One of the things I have noticed about teaching younger players, is that they wish to play the first move they think of. It is a hard habit to get them out of, especially when I am sometimes guilty of the same offence. An example of this is a game I played the other night at Belconnen Chess Club. After my opponent dropped a pawn due to an hallucination (see move 13), I had a much better position. Choosing to simplify to a better ending, I left the c pawn hanging due to the bishop fork on e4. But, if I had slowed down a bit and looked at *all* checks and captures I would have found a significantly better move. While it did not make a difference to the final result, it is still something I would rather not miss, as there will come a time when a quick and lazy move may well cost me the game. When my chess career started, all I wanted to do was exchange pieces. This had nothing to do with my endgame technique, but simply as away of prolonging the game, and avoiding quick and brutal checkmates. Of course this strategy didn't improve my win ratio, and it took me a number of years to look beyond automatic captures. At the current Gashimov Memorial event, Magnus Carlsen created a good example of 'exchanging to win'. Against regular opponent Viswanathan Anand he created a target on the queenside, and then exchanged off the pieces that were not needed to exploit it. He was helped by Anand at some crucial points, especially at move 28 and 29, but once the a pawn was captured it was simply a matter of running Black out of moves. If you are planning to maximise your chess in April, don't forget to enter the 2019 Sydney International Open. This resurrected event is running from the 24th to the 28th of April, at Macquarie University in Sydney. Eagle eyed readers will realise the the 25th of April is ANZAC Day in Australia, so it is possible to play 7 of the 9 rounds, even if you have to go back to work (for Sydneysiders of course). Full details of the event are at http://siochess.com/ while you can enter at this link Checking out the last set of entries, the event is very top heavy with titled players, so if you are looking to gain rating points (or upset a few GM's), no is the time to jump on board. (NB There is a late fee so enter early). The 2019 Shamkir Chess (Gashimov Memorial) has just started in Shamkir, Azerbaijan. Top seed is Magnus Carlsen and the field is an interesting mix of generations. Ding Liren and Anish Giri represent the best of the new generation, but Anand, Grischuk and Topalov are hoping to show that it isn't just a young mans game. Mamedyarov, Radjabov, Karjakin and Navara round out the 10 player field. For Australian players, the games start at a sensible 10pm (Canberra time), and round 1 is already under way. There are a couple of interesting first round match ups, but the Karjakin - Liren game has already finished in a draw after 45 minutes play! I am currently helping write a book on the history of the Laws of Chess. I am working with Stewart Reuben and Alex McFarlane, and while we plan to go back as far as we can, it will be the modern era (since 1924) which will be the focus. In the book we hope to put in games that provoked changes, or showed that more work needed to be done. One such game is the Rumens v Mabbs game from 1959, which provoked an enormous amount of discussion at the time. The time limit was 36 moves in 2 hours, and both players were in severe time trouble. Rumens mated Mabbs with his 36th move, but his flag fell before he could press his clock. At the time the rules were a little contradictory, with checkmate ending the game, but the move not being completed until the clock had been pressed. Therefore it wasn't clear if White had won by checkmate, or had lost on time. On appeal the game was awarded to White, and the rules were amended to reflect this. The somewhat bizarre adventures of Timur Gareyev at the US Championship continue. Having given up on his dream of winning two events at the same time, he is instead using the extra time to play some of the more esoteric endings in chess. Against Wesley So he was unsuccessful in trying to defend K+R v K+Q, getting mated on move 86. He then play R v R+B not once but twice in the following rounds. Weirdly he managed to hold the draw the first time he reached the position (against Sevian), but then lost against Caruana when faced with the same situation. While defending these positions are quite difficult, at least in the case of R+BvR, they are usually theoretically drawn (Note: I lost the only time I tried to defend the position). But like learning to mate with B+N v K, or winning a number of technical rook endings, it does take a lot of study and practice. So the next time rain keeps you indoors on a Sunday, break out the chessboard and see how well you do. I suspect we've all played games where we've blundered quite early on. Usually this is dropping a pawn (or a piece in a few of my efforts), but it is pretty rare to allow a mating attack starting on move 4. In this game from the current European Championship I suspect Black thought that 3... h6 would prevent 4.Ng5, but he missed the far stronger followup. GM Timur Gareyev is one of the chess worlds more flamboyant characters. At the moment he is playing in the US Championship, as well as another tournament, almost simultaneously. For some reason known only to Timur, he thought he could play in the Mid West Open at the same time, ignoring the fact that some rounds clashed, and that he had to travel between 2 venues. As a result he turned up 25 minutes late for his Round 4 US Championship game, and eventually forfeited his remaining Mid West Open games. Gareyev is not the first player to try this btw, but it does raise the question of whether it is actually legal. As a junior Michael Adams once entered two different sections of the British Championship, and had to run between rooms to play two games at once. There did not seem to objections to this at the time, and the organisers allowed this. During my previous time on the FIDE Rules Commission this issue was actually discussed, but in the end it was decided not to add any regulations dealing with this. The main reason was that any sensible organiser would hopefully reject an attempt by a player to enter twice, either in different sections, or even the same section. If the player kicked up a fuss, then the 'organisers decision is final' rule would be enforced. The Gareyev case is a little different, as the events were held in different venues, and organised by different bodies, but one outcome of this might be to add an extra clause to players contracts, forbidding them from pulling such a stunt! Since then the game has been played multiple times, with all but 2 games ending in a draw (in my database anyway). Curiously, the 2 non drawn games follow an early recommendation of playing 10 ... Ne5+ 11.Rxe5 Be6 which was assessed unclear in the pre-computer era, but is simply better for Black according to Stockfish. However in the actual games it was one win for each colour, with the White winner being David Smerdon in 1999, after IM Stephen Solomon misplayed the attack on White's King. The 2019 O2C Doeberl Cup starts in under 4 weeks, and at this stage around 50% of the tournament places have been field. The Premier has 36 entries so far, with 5 GM's, 6 IM's, 1 WGM and 1 WIM in the tournament. There is a limit of 68 players in the event (to make earning titles easier), so it might be a good idea to get your entry in, if you plan to play in this section. The Major (Under 2000) has 36 entries (from 64 places), the Minor (Under 1600) 42 players (from 100), and the Mini (Under 1200) 29 (from 60). You can register at http://www.doeberlcup.com.au/ as well as looking at who else has entered, tournament regulations, and prizes on offer. The 2019 US Chess Championship started yesterday in St Louis, and there was a somewhat curious set of results. In the Open Championship, all but one of the games were drawn. The Gareyev - Xiong game ended in a win for Xiong, but every other game saw the honours shared. This isn't that surprising for an event like this, and has the added benefit (for the organisers at least), of reducing the number of possible winners of the '$64,000 Fischer Bonus Prize' to one. On the other hand every game in the Women's Championship wasn't drawn. All 6 games ended in a win for one of the players, and as the Fischer Bonus Prize is also on offer in this event, half the field is still in the running. If you want to follow this event, then you can do so via the tournament website. As the time zones for the US aren't great for Australia, it is probably better to catch the end of the round (which normally has a few games running at 7am local time), than stay up for the start. "Don't worry, he has no idea about king safety". This was a quote from GM Elshan Moradiabadi when preparing the PNG team at the 2018 Olympiad. He was talking about one of our opponents, but he could well have been talking about me. Despite having a number of good results and games recently, I still have a tendency to ignore potential threats against my own king, while pursuing plans of my own. Of course I'm not the only player guilty of this sin. It is very tempting to treat a game as race, where checkmating your opponent before they checkmate you is a viable strategy. When it works, all is right in the world, but when it goes wrong, it can do so in a big way. Sometimes I will win a game of chess, and find that I did not really enjoy it. This usually happens when I know I've played a number of awful moves, and it is only a mistake from my opponent that has given me the point. This happened this evening at my club, where around 40 moves of plan-less play was redeemed by outplaying my opponent in a R+3P ending, with all the pawns on the same side of the board. But the game I will show, is from an earlier round of the same tournament. My opponent went for the king side hack, offering a piece I shouldn't take. Instead I decided I could take the piece, as I thought I saw how I could defend. However after my opponent played 16.Rh6! I realised I was in a bad way. If he had then played either 18.Rh7+!! (forced mate) or 19.Qh4! (covering g5) I would have resigned in short order, but instead he blundered with 19.Qh2? and the tables were truly turned. I converted the winning ending (and even then failed to calculate the best line), but left the club unsatisfied with the point. Have a look at the game below, after White has played his 15th move. A similar position to this occurred at Street Chess on Saturday, and at first glance I just assumed White had a big advantage. (NB I cannot recall which White rook was on d1, so White's 14th move may have been Raxd1). With the bishop well posted on f3, and being the first to get to the d file, all I could see was White using the initiative to win the game (and in the game on Saturday, this is what happened). So I am a little surprised that Black won the game given here. Of course the black pieces were being handled by GM Gawain Jones, and he did out rate his opponent by a significant amount, but White should at least hold this. Playing though the game a few times (with the engine off) I suspect that White was a little eager to swap pieces off (especially the bishops), until it reached a point (on move 31) when the final rook exchange left White with a lost pawn ending. If there is a lesson to be had here, maybe it is that if you look like you have an advantage, keep the pieces that give you the advantage! One of the duties I usually perform when arbiting small events (less than 20 boards), is to produce a game file. Normally there is enough time during the following round to type in the majority of games, and by the end of the event I usually have around 80% of the games ready for download. But this has become more challenging over the last couple of years. 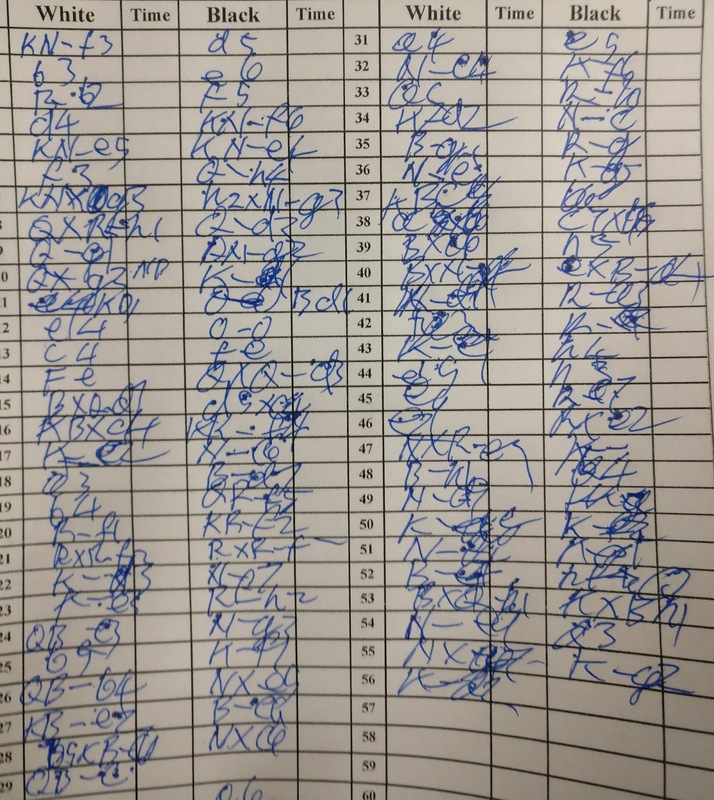 One of the main reasons is that players either submit unreadable scoresheets, or ones that have illegal or ambiguous moves. As frustrating as this is, it occurred to me that as an activity, competition chess requires a skill that is no longer in fashion. That is, chess is one of the few activities where people are actually required to write. Most office jobs now involve typing things, and when something needs to be written down, it is often as a personal note or brief message. In fact the only other place where I come across a lot of handwriting is in the education sector (especially exams and quizzes), and recently marked a number of quiz papers, the quality of submissions is equally mixed. 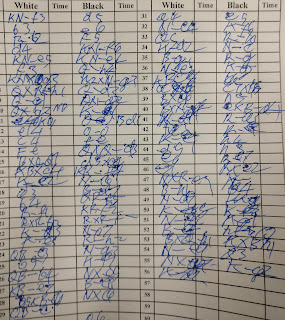 As an example, here is a scoresheet I took a copy of from the recent ACT Championships. I have cropped the names to protect the guilty, but as yet, I have not been successful in deciphering most of the moves. Taking advantage of an online book sale a couple of weeks ago, I thought I had picked up a bargain when i spotted David Bronstein's "The Chess Struggle in Practice". I'd seen a few people mention it as one of the classics, so buying it for $2 seemed like a great deal. Alas, when it arrived I realised I had purchased a book I already owned. Bronstein's classic is also known as "Zurich International Chess Tournament 1953" and I already had a copy sitting on my shelf. Nonetheless, I won't be getting rid of my newer copy, as there are a few formatting differences that make it worth keeping. And as a book, it is probably worth reading twice, once in algebraic, and once in descriptive! I find it interesting going through my own games from the pre-computer age of chess. It certainly shows me that I wasn't very good when I started playing seriously, but it also reveals that I wasn't that great at analysis either. There are more than a few games where I've kind of remember playing well, but after putting it through a modern engine, I've realised that it was more a question of "who makes the second last mistake" that decides the outcome. The game I've chosen to show this was not in fact my first (or second choice). However, those games turned out to be true blunder fests (including missed forced mates from my opponents), leaving me with this relatively tame example. There were a couple of opportunities for me to gain the upper hand (14.fxe6! and 18.Bxd5!) but the real mistake for my opponent was 22...Nf5. This allowed me to capture on d5, and get the tactics working in my favour. Fortunately there were no big mistakes after that (although I did miss a line leading to a quicker checkmate). The recently completed Batavia GM tournament in Amsterdam tried a new approach to scoring. Before the main game in each round the layers played a blitz match, which was then used to allocate points in case the main game was drawn. The winner of the main game scored 2 points, but in the case of a draw, the winner of the blitz match scored 1 point, but the loser only received 0.5 of a point. Whether it changed how the tournament was played I'm not sure, but from the score table, it looked as though there were a lot of decisive games. The added bonus was that there were a number of entertaining blitz games as well. The most noticeable was John Van Der Wiel getting mated on move 15, in a game that has been played a couple of times previously. FM Michael Kethro is the 2019 ACT Chess Champion after finishing with a perfect 7 wins from 7 games. In today's final two rounds he started with a win over Victor Braguine, before beating Brian Butler in the final round. He finished a point and half against Sankeerten Badrinarayan, who had the unsettling experience of playing his younger brother in the final round (the game ended in a draw). Tied for third were Glenn Ingham and unrated player Darryl Chen. The Under 1500 prize was shared between Paul Dunn and Dexuan Kong, while Velsami Karthick and Ken Zhang winning the Unrated prize (Chen taking a share of third place instead). The win by Kethro also means he now holds all three ACT Championship titles, winning the Rapidplay in December 2018 and the Blitz in January 2019. This is possibly the first time this as happened, although IM Junta Ikeda may have also achieved the feat in a previous year. Full results from the tournament and games from the top 4 boards can be found here. With two rounds left to play, FM Michael Kethro holds a full point lead in the 2019 ACT Chess Championship. Kethro defeated Sankeertan Badrinrayan in a fairly wild round 4 game, before scoring a quick win over Tim Pearce. Pearce, who only lost this game, shares second place with Badrinarayan and Victor Braguine. Round 5 saw a number of interesting finishes, including Matt Radisich playing a nice combination that left him a rook up. Unfortunately his opponents next move left him in a mating net and resigned immediately. This wasn't the only tragic finish, with another game ending in stalemate in a K v KRBP ending. Three players are still tied for first place after the third round of the ACT Chess Championship. Tournament favourite FM Michael Kethro is one of those players, after winning a long game against Pertti Sirkka. He is joined by Sankeertan Badrinarayan and Tim Pearce, the latter beating Victor Braguine in a game where Pearce's attack on the kingside proved more effective than Braguine's play on the queenside. Close behind them on 2.5 is unrated player Darryl Chan. A former junior player from Sydney, Chan scored an upset win over Yizhen Diao in round 1, and followed this up with a draw and a win. In round 4 he plays Pearce, while Kethro and Badrinarayan meet on the top board. The 2019 ACT Chess Championship is underway, attracting a field of 34 players. This seems to be the magic number for this event, as the last few years has seen similarly sized fields. Top seed in the tournament is FM Michael Kethro, and he was made to work for his point by Erik Jochimsen. Eventually a favourable ending for Kethro was reached and he was able to convert by running Jochimsen out of moves. One of the more exciting games of the tournament was between Victor Braguine and Kamrin Aliyev on board 3. Aliyev had a stronger position, while Braguine had greater attacking chances. In time trouble Aliyev missed Braguines attacking plan and was forced to resign when faced with unstoppable mate. There were a couple of upsets on the lower boards with Darryl Chan beating Yizhen Diao, and junior player Fahim Vidyattama drawing with veteran Bill Egan. Despite enjoying Transfer Chess (or Bughouse) when I was younger, I do have an aversion to the game these days. My main complaint is that it makes sorting out chess sets for the next competition/lesson/club night a chore. So I have mixed feelings about sharing the following chess variant with you. The 2019 World Teams Championship began last night in Astana. This event brings together the best teams from every continent (Asia, Europe, Americas and Africa) as well as the topped placed teams from the Olympiad. Ten teams are in each section (Open and Women's) and it is a 9 round round robin, scored on match points. The first round saw a couple of big wins for India and China. They each scored 3.5/4 with Sweden and Azerbaijan being their respective victims. In the Inda-Sweden match, there were a couple of nice attacking wins, including this one by SS Ganguly. One thing noticeable in looking at very old chess books and publications, is the absence of what is now familiar punctuation. No ! or ? moves, just wordier comments ('good move', or 'shocking mistake'). Even + for check took a long time to come into vogue. According to William Edward Winter's "Chess Notes", the first sighting of ! (or in this case !!) occurred in 1874 in "The Westminster Papers". It was included in the notes to the following game, although it's use may not have been intentional. The game itself is not that high quality, and soon Black finds himself up a rook. (As an aside it is actually very similar to the game I published yesterday). But White chooses not to resign, and eventually Black catches the king in a mating net. However at move 33 Black misses a mate in one. In the comments, Zukertort states "We prefer 33 R to K7 mate !!". Given that !! usually points to a brilliant and hard to find move, I suspect the exclamation marks here are for dramatic effect, rather than a comment on the quality of the move. "Pin and win" is a fairly common piece of advice given to young players. And when it works, the game can be over quite quickly. Here is an example from a junior event I was directing today. The title of this post refers to a joke that will never be published on this blog! But the gist of it is that for all the good thing you do, it is the one bad thing that will be remembered. Fabiano Caruana took on Pentala Harikrishna in the St Louis Champions Showdown. Over the 12 rapid and 24 blitz games, Caruana was pretty dominant, winning 35.5-12.5 (rapid counting for double points). But the game everyone remembers is the one given below. It was blitz game number 20, and faced with what looked like inevitable mate, Caruana resigned. Only then was it pointed out that Caruana had missed the winning 62.Qb4+ And long after the score of this match is forgotten, I'm pretty sure this game will be well remembered.